Sam Vokes was delighted to extend his hot streak in front of goal to four in six games with the winner against Hull on Saturday. But the Wales striker was honest enough to admit the referee Graham Scott was right to ignore his claims for a penalty. Vokes hit his eighth goal of the season to see off the Tigers at Turf Moor, and narrow their lead at the top of the Championship to a solitary point. 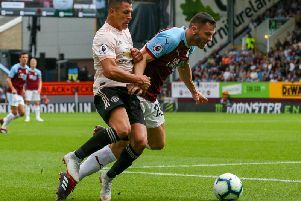 The 26-year-old reacted first after Allan McGregor spilled a shot from Joey Barton, with 14 minutes remaining, and Vokes said: “It’s always important for strikers to be getting in and among the goals, and for me, it’s a good little run I’m on at the minute, but I just want to keep that going. “We obviously knew the conditions, and Joey had a shot low and hard, and it was a tough one for the keeper as it skidded off the pitch, and it was all about reacting to that, and I managed to get on the end of it. “I think the first goal was always going to be important, as the game panned out it seemed like it was going to be one goal either way to win it. Four minutes later, Vokes tried to drag the ball past McGregor, and though he was clipped by the keeper, his fall saw him booked for simulation. Vokes, who was criticised on Match of the Day last season for not going to ground to win a penalty against Swansea, smiled: “It was a little bit dramatic, to be fair! “I said to McGregor at the end, and he said he caught me, but it was one of those. “I didn’t expect a penalty. The ball got away from me, I was probably more gutted I didn’t take the chance when it first landed to be honest. “I’ll probably get battered for trying to go down, but it’s how it goes sometimes, it’s the way it is. “I’ll hold my hands up, he’s probably caught me, but it wasn’t a penalty. Vokes claimed the headlines in a season where 18-goal Andre Gray has often commanded them himself, but Vokes said: “I think Andre was a nuisance again, and had a great game. He didn’t get his goal, but the workrate he put in was fantastic. “I think we both work hard for each other. Hull probably came and sat back a little bit, and it was important the two of us worked hard, and put in a big shift. It was important to put a big press on and we managed to do that.